Next principle we need to discuss is the Principle of Subordination of Individual Interests to the General Interest. It is common experience that 'what should be' is very different from 'what is' for everyone and in every aspect of living. In one sense, the very living of an individual can be generally described, under normal circumstances, as a steady movement from what is to the chosen what should be. For instance, a clerk strives to becocme a manager; a political volunteer aspires to become an MLA first, then, a Minister if not the Chief Minister. Very often, it appears to be a fact that what should be seems to elude the grasp of every individual; at the end, even if he reaches his what should be, he realizes that it is not the same level he aspired for though the end may be the same. What it generally suggests is that disappointment in some form or other is the common lot of all. Adjustment with unhappiness is not achievement of happiness. All, almost all, adjust with their living wherever they find themselves since they have to go on. Against this background, we have to look into this principle of subordination of individual interests to the general interests which here stand for the interests of the institution to which one belongs. First thing that an employee must remember is that an institution also, like himself , has an objective, a goal for which it has been established. And, under any circumstances, an institution is larger than any individual, any employee. Fayol says in unambiguous terms that the interests, the goal of the institution must come first for any employee since his very entry into employment indicates his willingness to work for the goal of the institution. Subordination of the individual interests to the interests of the company is never easily achieved since the company, when all said and done, is certainly external to the employee. Here comes the most difficult task of the manager. He has to monitor the work of the employee in such a way that he is able to make the employee, if not convince him, work for the institution compromising his interests if they conflict with those of the institution. It might look that Henri Fayol is against the unions since he is firm on the principle of subordination of the personal interests to those of the institution. In fact, he was not against unions; he never opposed giving benefits to workers. He urged for 'constant supervision' which will enable the manager to detect at the earliest any wavering and wasting by any employee. He must be tactful in helping the employee achieve the necessary balance between his interests and the interests of the institution. What the employee must understand is the success of the institution in reaching the goal will certainly bring benefits to the employee. Once this understanding happens in an employee, he will be free of conflict and he knows where his interets end, legitimately too. In such positive mood if all employees, or almost all employees function in the institution, the workplace will not be a burden; but it will turn into another home, though an ancillary one. Where there is voluntary subordination, not forced suppression, of personal interests among the employees, there will be efficiency and smooth relationships among themselves. 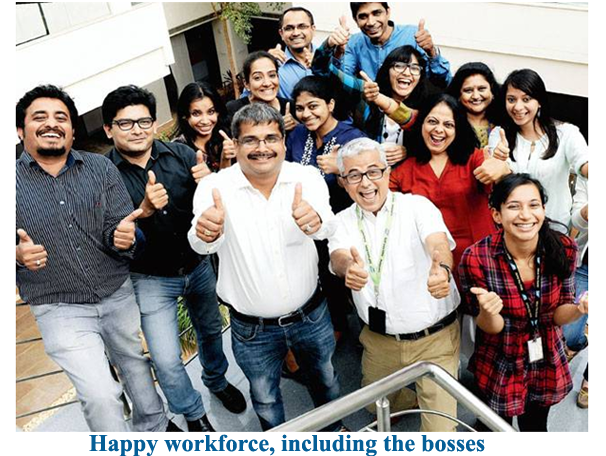 An organization with such employees cannot but succeed, earning reputation and social recognition which in turn adds dignity to the employee for his presence in the organization. Work becomes a participation in a larger goal and not a necessary evil to earn bread.